It’s no secret both the NFL and NBA are heading towards what are sure to be contentious labor negotiations between players and owners this summer. There’s a real chance both leagues could be headed toward lockouts as well. I’ve always thought this to be a fascinating aspect of the fan-player and fan-owner dynamics. When you break it down to its core, who are players? They’re employees, granted very well compensated employees, but they’re still employees. Who are owners? They’re employers. Finally, who are about 99% of the fans? Employees of some kind. So it stands to reason that fans would identify more with players during these negotiations, right? Not the case. Fans play the “I’d play for free” card and have a very difficult time relating to millionaire players, but have no problem backing billionaire owners. For some reason the Players Association’s of the NFL, NBA and MLB have had a difficult time getting their message across to everyday fans. The PR playbook has always been to have the head of the players union play hard ball in a series of media tours. They attack commissioners and owners in each league, roll out the players negotiation talking points and essentially attempt to take the heat while shielding players from the dialogue. But that strategy usually fails with fans. Fans have been unable to buy into that separation between the union as an entity and the individual players. But, the NFLPA is finally changing that playbook. In what makes perfect sense as this is the first real major sports collective bargaining agreement negotiation in the Social Media Age, the NFLPA is taking the battle online, launching the website NFLLockout.com, a twitter account and Facebook Page. But there’s more to the strategy, not only have they launched these sites, they’ve branded the campaign “NFL Lockout”. It’s difficult in some cases to even tell if the NFLPA is actually affiliated. NFLLockout.com is basically a blog standing on its own, not a campaign living on the official NFLPA website. Although its crystal clear which side and whose message the campaign is backing. So, they’ve essentially used the online campaign to change the connection with fans, who fans view as the villain and turned fans into ambassadors of both the campaign and the players. Instead of talking about millions of dollars already millionaire players might lose, a simply unrelatable concept for the average person, the NFLPA is using the “NFL Lockout” campaign to frame owners as a group trying to stop football and take football away from fans. To bring awareness to the campaign the NFLPA has tagged Tuesday, January 18 as #LETUSPLAY DAY, an online movement where they’ve created the hashtag #LETUSPLAY. 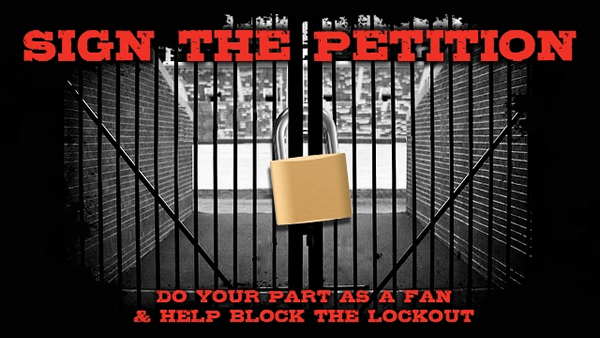 The genius behind #LETUSPLAY DAY is several prepared Facebook and Twitter posts where they ask fans to post “…help NFL players and fans #blockthelockout” to Facebook and Twitter. What does this accomplish? It positions fans and players as being on the same side of the debate and puts even more pressure on the owners. It will be interesting to see if the campaign has legs and ultimately keeps fan opinion with the players for the long-term, especially the closer we get to an actual lockout towards the end of summer. It will take patience for the NFLPA to stick to their guns and not go back to the old playbook, but in the short-term this was a tremendous PR move. Now we’ll have to see if the NBPA can be as creative and forward thinking, but one thing I can tell you is to not bother searching GoDaddy for the NBALockout.com domain name, it’s already taken. Doesn’t sound like something a “regular Joe” would say, right? More like a crafted message from a politician’s speechwriter or some other high ranking government official. But that quote comes from Dave Cummings, a New Hampshire father of three young children, a communications director for a Realtors association and a member of his towns school board. Now that’s a regular Joe, right? But, Dave Cummings is no regular Joe. He’s the man behind Hoops For Heroes, a non-profit with the mission of providing financial support for those that have sacrificed for our nation. Dave’s daily tribute? He’s not just shooting, but MAKING anywhere from 1,000 to 2,000 free throws everyday, and he’s been doing this since Veterans Day 2009! Yes, I said 2009. Everyday. To put that in perspective, Kevin Durant led the NBA in free throws made in 2009-10 and he made 756 the entire season. Dave makes more than that everyday! As of this writing Dave has made 587,007 free throws. The ultimate goal? To donate $1,000,000 to the Intrepid Fallen Heroes Fund. To date, Dave has raised $43,681 for the Intrepid Fallen Heroes Fund. To make this happen Dave wakes up before work and stays up late after work. He mostly shoots in his driveway, but when the weather in New Hampshire is too much (he’s set the “inside bar” at 5 degrees, yes you read that right) he goes to a local school, but he shoots every day. He’s literally a man on a mission. I generally use this blog to comment on popular sports stories and how they could have been handled better in terms of PR, or highlight ones handled really well, but this time I want to use this blog to get more PR for a story. Dave has done well spreading his mission, he’s been in USA Today and recently shot one of his free throws during a timeout of a Celtics game at the TD Garden in Boston. But he needs more help. Correct that, he deserves more help. So I ask you to make a donation, share this post, follow his blog, follow his daily free throw updates on Twitter, “like” his Facebook Page, check out his YouTube Channel and help spread his amazing mission to more people and hopefully raise more money for our fallen soldiers. My goal? I want to help get Hoops For Heroes more attention. Maybe get the NBA involved, it would be a great match. NBA All-Star Weekend is coming up next month, Dave could shoot a free throw during a timeout of the game on National TV, or better yet how about the NBA Finals? Either way, this story needs more attention, Dave deserves a big thank you himself and most importantly the Intrepid Fallen Heroes Fund and our many service men and women and their families need more funds. I haven’t blogged in a while due to my wife and I having our second child, a son, in March. Needless to say both time and sleep have been extremely limited over the last six months. Many things have gone down in the sports world during this time that I wanted to write about, but when you’re a walking zombie it’s tough to get your thoughts together:). Some sad news over the weekend compelled me to break my blog silence, and hopefully post more regularly going forward. Sunday morning I heard the news that longtime Detroit Pistons PR Man, Matt Dobek, had passed away when I received an e-mail from Jeff Twiss, my friend, former boss and longtime Boston Celtics PR Man. It was a shocking message to receive as Dobek was only 51 years old. He worked for the Pistons for 29 years, sported three NBA Championship rings and served as the PR Representative for the original 1992 Dream Team. He was highly respected in the NBA and sports PR world. It was the 2004-05 NBA season, the Pistons were making annual runs to the Eastern Conference Finals, and I was in Detroit,well Auburn Hills, with the Celtics for a regular season game. Prior to the trip, Twiss informed me Tommy Heinsohn, Celtics Hall of Famer, Championship coach and current broadcaster requested 4 tickets for a friend in the Detroit area. And when Tommy makes a request you come through. For a little background, doling out tickets can be one of the more stressful aspects of traveling with a team for a PR person. Each player gets two tickets, but almost all of them want more. There’s plenty of trading and bartering that goes on, and you always have to hope there’s some extra left over for emergencies. To complicate things even more, broadcasters don’t get tickets, so I was going to have to snag four off the top from our team allotment for Tommy before even getting to the players. Let’s skip ahead a little. It’s 45 minutes before tip-off and I had just closed the locker room to the media. It had been a busier than normal pregame as some fires had come up that I had to put out. I was happy to finally have some down time to grab a bite before the game, so I headed to the press room. Just as I walk in I cross paths with Tommy and he checks with me to make sure his tickets are at will-call. See where this is headed? As I thought for a second, I could feel the panic overcoming me. I realized I had completely forgotten about Tommy’s request, and to make matters worse I was wiped out of tickets. In a state of panic I did probably the worst thing. Sounding like Ralphy in A Christmas Story when he says to the mall Santa Claus “football, yeah a football”, I muttered to Tommy “tickets, yeah tickets, taken care of”. Immediately I bolted out of the press room, scurrying in the bowels of The Palace for anyone that might be able to throw a young PR guy on one of his first solo road trips a bone. I had basically just screwed one of the all-time iconic Celtics. Who do I come across, Matt Dobek. Matt could tell I looked more than a little flustered and asked if I needed anything. Remember, this was the heyday of the Rasheed Wallace-Chauncey Billups Pistons and the franchise was on an incredible run of sellouts. Extremely nervous to make this kind of request to one of the most tenured PR people in the league, basically admitting my mistake, I swallowed my pride and told Matt about my need for four extra tickets for Heinsohn. Long story short, Dobek made one call and within minutes a Pistons sales rep was outside our locker room with four tickets, good tickets, for Tommy Heinsohn’s guests. Crisis averted thanks to Matt Dobek! Again, I didn’t know him very well, and this was a less than earth-shattering story, but it certainly meant a lot to me. It would have been extremely embarrassing to hear about Tommy Heinsohn’s guests not getting into the building that night, and might have ended my road trips with the Celtics for a long while. So thanks Matt! RIP! P.S. Twisster, if you’re reading this I hope you can look back and have a good laugh, as I don’t think I ever shared this with you :). Apparently expanding the greatest tournament on Earth is almost a done deal. According the Sports by Brooks, sources at ESPN say the NCAA basketball tournament expanding to 96 teams is a “done deal”. Many fans of college basketball, analysts and those in the game feel adding 30 teams to March Madness is a horrible idea. Why mess with something that clearly isn’t broken, especially when the NCAA is catching heat every year regarding the mess that is the college football bowl system. Normally I’d be getting into the PR ramifications of this decision, but when speaking of the NCAA that could really be an entire series of posts. PR isn’t exactly their forte. So instead, as a lifelong college basketball fan, I simply want to give my idea to expand the tournament without destroying the current format, but while also increasing publicity and revenue for the NCAA. I’ve always had the following idea about the play-in game, and through discussions with friends, other college basketball fans and on #SportsPRChat on Twitter it has evolved. I’m not sure if anyone else has proposed this, but I’ve always felt the play-in game was a decent idea, just horribly executed. First, why should two teams that earned automatic bids have to participate in a play-in game? Second, why do I want to watch two of the worst teams in the field play for the right to get trounced by the likes of North Carolina, Kansas or Duke? There’s zero excitement. I propose we expand the tournament from 64 to 68 teams by adding three additional play-in games. The change is that the now four play-in games would be between the last four at-large teams in the tournament and the last four out of the tournament. The winners of the four games will then be slotted into the four #12 seed positions. This results in far more exposure, publicity and revenue for the play-in games. This season for example, instead of watching two small conference teams battle it out to get trounced by Kansas or Kentucky, we could see eight BCS or talented mid-major teams fight it out. Going by ESPN.com Joe Lunardi’s most recent bracketology, with this idea, the Tuesday before the official tournament kicks-off we’d potentially see Maryland vs. Wichita St., Old Dominion vs. Marquette, Cincinnati vs. Seton Hall and Connecticut vs. Louisville. Who wouldn’t want to watch those teams fight it out for a chance to be an upset special in the Big Dance? Almost every year there’s a #12 seed that makes a run in the tournament. This might not add as much revenue as the NCAA is looking for, but as mentioned it adds more excitement. The four play-in games would be far more interesting. It wouldn’t render the regular season basically irrelevant, like adding 30 more teams would do, and it wouldn’t minimize the anticipation and excitement of the current first round. This would probably only slow the move to 96 teams, but I think this change to the play-in system would be a good one even if they don’t expand the tournament. Either way, I’d love to hear thoughts on this idea, or any other ideas on how to improve the tournament in the comments below. Could Keith Olbermann be a PR Problem for Roger Goodell and the NFL? I was having an e-mail discussion with my buddy Chappy Wednesday morning. Chappy lives in Boston, and if you regularly read this blog you know I’ve lived there as well, so our discussion inevitably ended up on the Massachusetts Senate results. We discussed a few different aspects of the race, which eventually led to Keith Olbermann’s comments following the outcome, a win by Republican Scott Brown. When discussing Olbermann’s editorial, our exchange went into whether Olbermann poses a PR problem for NFL Commissioner Roger Goodell. If you remember, it wasn’t too long ago that Goodell had some harsh words for Rush Limbaugh. Limbaugh was attempting to become a minority owner with a group looking to buy the St. Louis Rams. The basis of Goodell’s objection to Limbaugh being part of the NFL was that “divisive comments” have no place in the NFL. What does this have to do with Keith Olbermann? For those that don’t know, besides having his own show on MSNBC, Olbermann also co-hosts NBC’s Football Night in America, the NFL’s primetime Sunday night showcase each week. There’s no question Goodell was under pressure to respond to criticism, whether right or wrong, about Limbaugh’s bid to become an owner. But, by entering the Limbaugh debate so strongly, did Goodell open himself up to answering what exactly is divisive language, from a political perspective, according to the NFL? It’s not out of the realm that reporters, or political groups with an agenda for that matter, could call for Goodell to respond to whether Olbermann’s comments are “divisive”. Now, this is a Sports PR/Marketing blog, not a political blog, so I’m not really interested in debating conservative/liberal or Limbaugh/Olbermann, at least not in this space. The question is, did Goodell overplay his hand with Limbaugh, almost setting a precedent where he has to respond when anyone affiliated with the NFL enters political debate? Is it out of line to question Goodell about whether Olbermann is too “divisive” to co-host Football Night in America? Should the NFL just stay away from extreme political commentators/figures playing a visible role in the league? Disclaimer: I hope we can have a healthy debate in the comments section, sticking to the PR aspects of this topic. Any comments using crude language or attacking another poster will be deleted. Is Social Media Boxing Out Access for Traditional Sports Media? I stumbled upon an old Bill Simmons (@SportsGuy33) column in which he discusses the dwindling access that reporters have to today’s athlete. His general premise is that social media is boxing out tradition sports media. Simmons hearkens back to a time when David Halberstam had one-on-one access for his book The Breaks of the Game, and reporters often hungout with the very athletes they covered. He calls it the “Scotch ‘n Sirloin Era”, with the current era being “The Twitter Era”. But, Simmons may not be the best authority on this topic. In my time in the Boston Celtics PR Department, I never saw Simmons in the locker room or at a shoot-around during media access, and never had a player interview request from him cross my desk, or that of my co-workers. But, his column still raises an interesting topic. How has the role of the PR person and sports media access in general been affected by social media, if at all? Is social media basically boxing out the traditional sports media? To gain a little more informed insight, I spoke with someone who’s been in the trenches on this issue from the start, long-time NBA PR man Terry Lyons (@TerryLyons). Lyons worked in the NBA from his days as a PR intern in 1981, up until 2007, when he moved on to start Terry Lyons Sports Marketing LLC. During his time, Lyons worked every NBA Finals, All-Star Weekend, NBA Draft and international event, including serving as the PR person for the Original Dream Team in 1992. He knows and understands this issue as well as anyone! Yes, in the NBA specifically, media seating continues to move further from the court, and the hordes of media surrounding players has increased tremendously. But, has the access actually “dwindled faster than A-Rod’s pectorals”, as Simmons put it? To answer the question, the access athletes and fans have to each other has evolved, and the way these mediums affect traditional sports media has changed, but the access is still there. Like Lyons suggests, access is still based on tried and true relationship building. Something social media can’t “box out”, it can only enhance, assuming traditional media embraces the changes. Is Gilbert Arenas Paying too Much of a Price? I owe Mike Schaffer, who runs #SportsPRChat on Twitter, a big thanks. I began participating in the chats last week, and not only are the they a great forum to connect with other sports and PR professionals, but they’re also a great source of blog ideas! 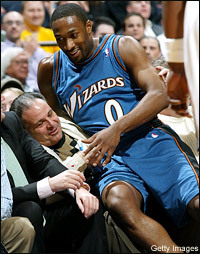 With that said, another great topic was brought up last week, whether or not the NBA, fans and media are making too big a deal of the Washington Wizards Gilbert Arenas bringing a gun into the locker room. For those living under a rock, Arenas pleaded guilty to a felony gun charge for bringing an unregistered gun into the Washington Wizards locker room. Since the initial charge, Arenas has been suspended indefinitely by the NBA, been dropped by Adidas and most likely will lose the remaining $80 million he’s still owed by the Wizards. So, between a potential short jail stint, losing $147,208 every time the Wizards step on the court and getting killed in the media and court of public opinion, is Arenas paying too much of a price, especially considering the gun wasn’t loaded and it seemed to be more of a joke than anything else? I say absolutely not! As someone that spent over four years working in an NBA locker room almost daily, I can attest that the phrase “the locker room is a sacred place” is accurate. What some don’t always realize is that in professional sports it’s not just the players and coaches on the inside. There’s media, team PR, marketing and community relations staff, equipment staff and trainers as well as ball boys who often times are high school kids or younger. The Arenas situation has me wondering, maybe I’ve been in a locker room that had guns inside. It’s definitely a possibility, and I can tell you I would have been very uncomfortable had I known at the time. The ball boy thing makes this especially bad in my opinion though. During the course of a game night it’s not uncommon for a player to have a ball boy go into his personal locker. Usually it’s something like getting money for a post-game food run. But regardless of the reason, it could have been a young ball boy that found the gun Arenas’ locker! Loaded or not, the possibility of bad outcomes are endless, and Arenas definitely broke a sacred trust. From my personal and PR perspective, the NBA, media and sponsors are handling this situation just fine. That’s not to say Arenas doesn’t deserve a second chance, but David Stern bringing down the hammer shows media, team personnel and Arenas’ peers they will be safe in the locker room. It shows fans and sponsors the NBA is taking this issue extremely seriously. So kudos to Stern, the Wizards and media who are holding Arenas accountable. Here’s to also hoping Arenas has learned a lesson and is able to resurrect his career.